Large patch is a common disease of warm-season turfgrasses in spring and fall. It's caused by the fungus Rhizoctonia solani. The fungus is present in the soil and thatch layer year-round, but only occurs under certain conditions. The fungus survives in the heat of summer, but thrives in cooler temps when the soil is wet. It becomes most active in temps below 70 degrees. The fungus spreads in the thatch layer and infects the grass's sheath, stolens and roots. It is especially severe in poorly drained and OVER-FERTILIZED turfgrass. Proper fertilization is a must to help prevent outbreaks of large patch. It also helps to improve drainage in areas that hold water or stay saturated for long periods. Mowing at the proper height will also help to control the disease. Aeration is another way to help decrease thatch build up and allow oxygen to the soil which favors plant health and growth and discourages disease. 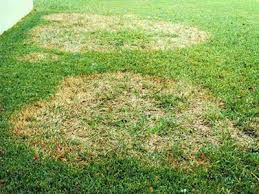 Fungicide treatments are a must to treat active large patch outbreaks and to help prevent future activity, and should be a staple in your lawn care progam.